Can you believe St. Patrick’s Day is almost here? Some people get really into it, some people not so much. First, that winter is almost over so the days of polar vortexes are numbered. 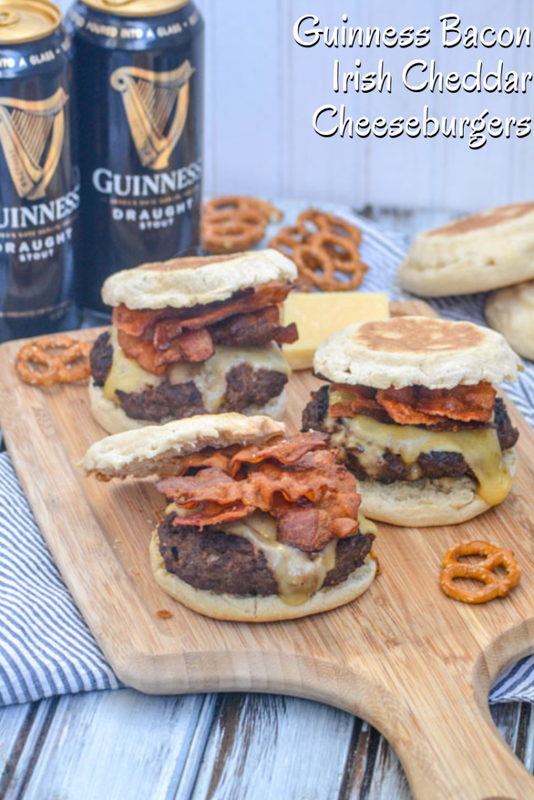 And second it gives us a great excuse to add Guinness to everything like these Guinness Bacon Irish Cheddar Cheeseburgers. 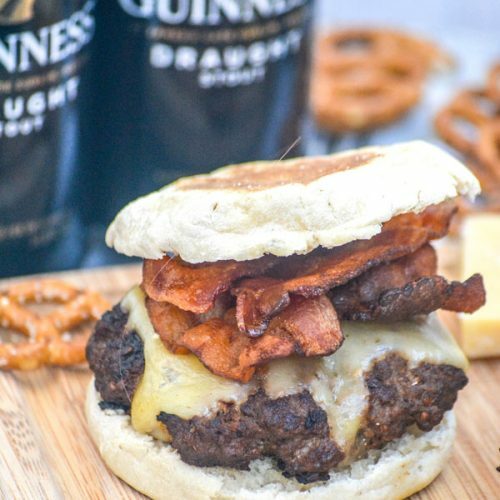 So let’s talk about this Guinness bacon Irish cheddar cheeseburger. Obviously we have the Guinness. Guinness itself has a very distinct flavor. It is a little sweet, a little bitter with a bit of a milky flavor. It is not a subtle beer. But don’t let that stop you from using it in cooking. Cooking mellows it a bit so it blends into the background of whatever you are making. 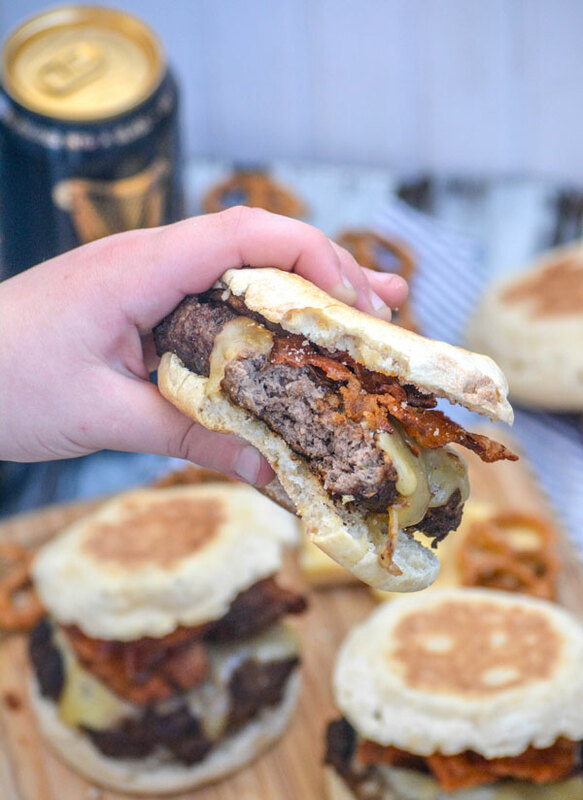 In these burgers, it just adds a depth of flavor that you wouldn’t get from just the beef alone. Plus the bit of extra moisture from the beer makes these burgers insanely juicy. The beer flavor also plays nicely with a little bit of bite from the dijon mustard, onion, and garlic. After you just combine the ingredients for the burger patty until they are mixed together, you form them into patties and cover them with plastic wrap before refrigerating them for an hour. This lets the flavors really meld together in the meat. Then after they are done in the fridge, you just cook them on a cast iron skillet over medium high heat, flipping as needed until the outsides are slightly charred. Once the burgers are done, you can build the burger. 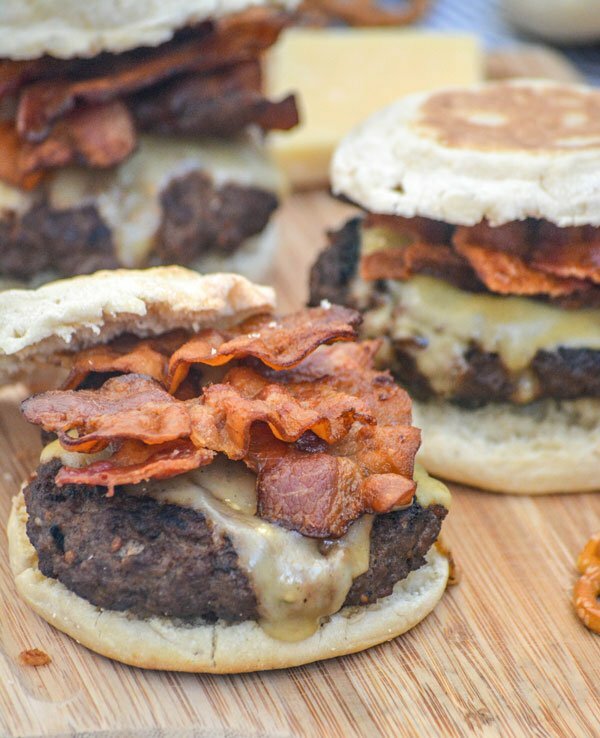 Put them on a toasted English muffin them with the Irish cheddar cheese and crispy bacon. If you have never had Irish cheddar, try it! It has a bite of sharpness, a very full flavor and a little touch of sweet. It’s sort of like the Guinness of the cheese world. The result? 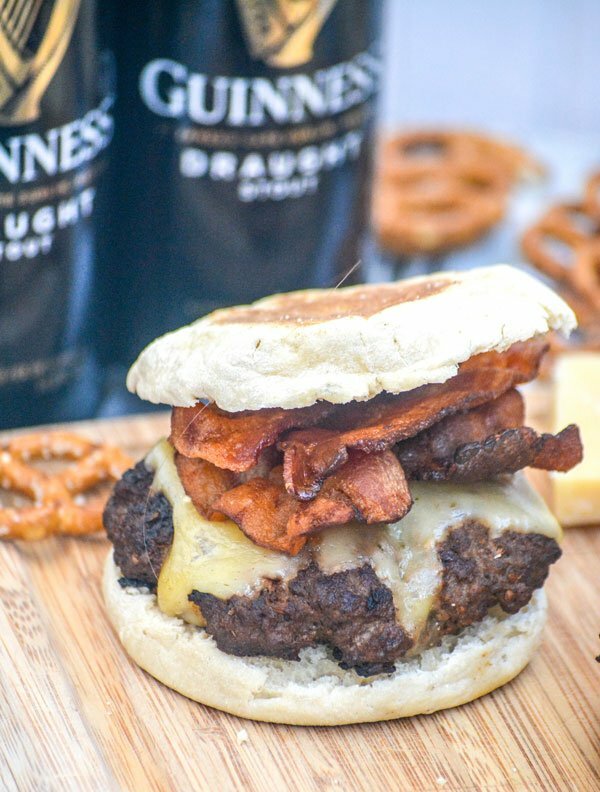 The most perfect Guinness bacon Irish cheddar cheeseburger that would be the highlight of any St. Patrick’s Day menu. 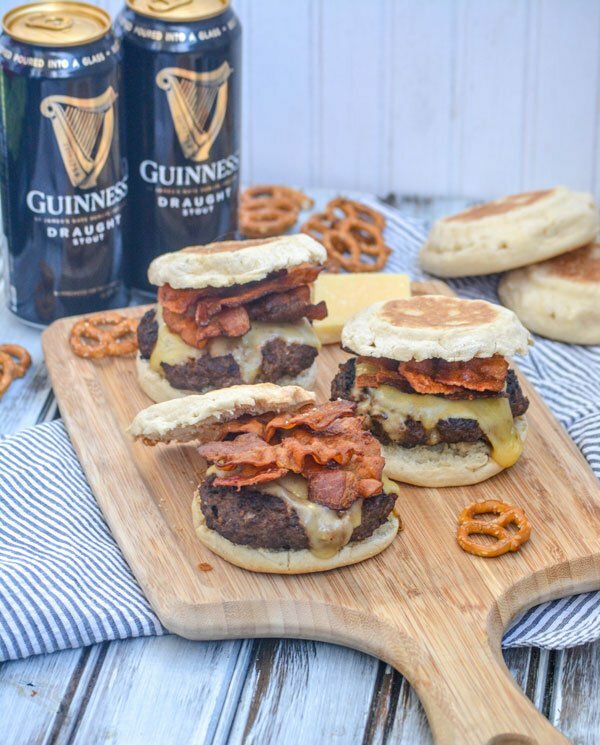 A savory burger, this one features a Guinness infused patty topped with creamy melted Irish cheddar, and crisp slices of bacon, sandwiched between toasted English muffins. Add the ingredients, ground beef through salt & pepper, to a large mixing bowl. Use your hands to mix everything together, JUST until evenly combined. Form the meat mixture into 4 patties or easy size, and transfer them to a pan. Use syran wrap to cover the pan, and refrigerate the patties for an hour. Lightly oil a cast iron skillet, and heat over medium high heat. Cook the patties, flipping as needed until lightly charred on the outside and cooked to your preferred level of 'done'. Remove the skillet from heat, and add sliced cheese. Let the patties rest just until the cheese has begun to melt. 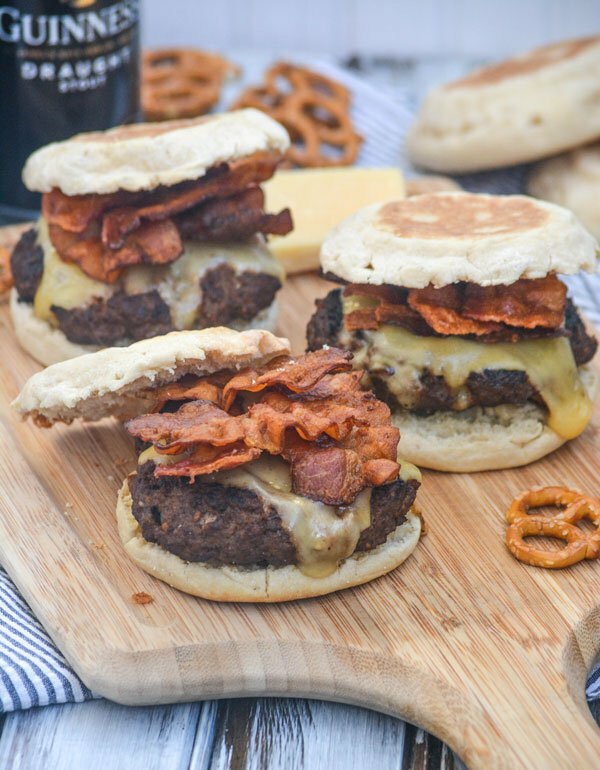 Transfer the patties to the English muffins, top with bacon, and any other desired toppings- serve immediately.